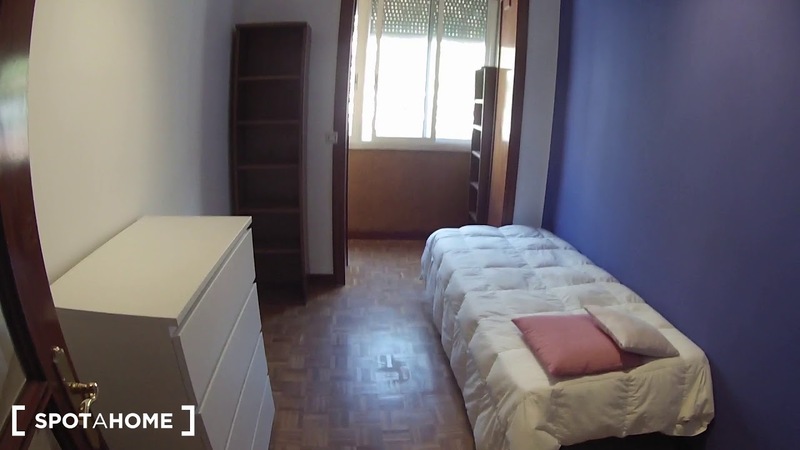 Charming rooms are for rent in a spacious flatshare near the Metro in Tetuán. The apartment has an enormous living room, where you can hang out on the large, L-shaped couch and get to know your new flatmates over your favorite TV shows. The kitchen is huge and has all the essentials, including an oven, a 4-burner stove, a microwave, a dishwasher, a washing machine, and an adorable breakfast nook. The rooms for rent all have lots of natural light, and each is well-furnished with a comfortable single bed. In the bathroom, you'll find a big bathtub and lovely tiling. You'll be living in Tetuán, a well-connected neighborhood just to the north of Madrid's city center. Around the area, you'll find lots of restaurants, cafes, tapas bars, and shops to enjoy. And, with a Metro station nearby, you'll never be far from anything in Madrid! All the rooms for rent have lots of sunlight. Metro Estrecho, which will take you right into Madrid's city center, is just a short walk from the property.